Learn more about the music therapists who work with our Kids Rock Cancer rock stars, Tracie Sandheinrich, Jaime Wilhite and Cara Stern Sudbrock. At a very young age, Tracie found herself sitting on a stack of books and magazines, piled just high enough to reach the piano keys. She grew up in a musical family, singing and playing music in her home church, and performing at the nursing home where her grandmother lived. It was always clear that Tracie knew and valued the power of music. After completing two years of college at SIUE, Tracie felt something was missing — until a chance meeting with a coworker whose daughter had graduated from Maryville University’s music therapy program. Music had taken a backseat in her life, but the opportunities music therapy offered reignited her passion. After completing her coursework in December 2007, Tracie held clinical internships at St. Luke’s Hospital (adult rehab) and BJC Hospice (end-of-life care). After graduation, Tracie worked with BJC Hospice in Farmington, where she brought music therapy to patients diagnosed with terminal illnesses, an experience she describes as intimate and honorable. “Even in an unfortunate situation like impending illness, music, at its finest, can bring physiological and psychological comfort not only to the patient, but to their family as well,” Tracie says. In March 2009, Tracie started Through Melody, a music therapy company that provides board certified music therapy services specializing in adult, geriatric and end-of-life care in southern Illinois and Metro East. Later that same year, Tracie was invited to help jumpstart Kids Rock Cancer. She is proud to have been able to watch the program flourish since inception. As Kids Rock Cancer’s senior music therapist, Tracie says she is constantly inspired by the young rock stars she works with. Her goal is to “keep the music playing,” and she encourages each and every participant to write their own story — because everyone has a song to sing. Tracie is currently attending Lindenwood University’s graduate program to earn a master’s degree in professional counseling. 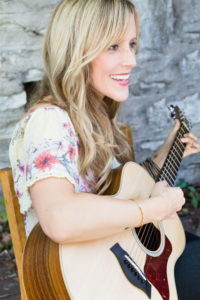 Jaime Wilhite has been a performing musician in the St. Louis area for 15 years. After a 10 year career in marketing she decided to take a leap of faith and switch professions to follow her passion using music to serve others. After much contemplation, she found a home at Maryville University and pursued a degree in music therapy. Six years later, she is a practicing board certified music therapist and is currently working on her master’s degree in music therapy at Maryville University — to be completed at the end of 2017. When she first heard of Kids Rock Cancer, she immediately got involved. With her event experience, she volunteered at events, assisted in program efforts and joined the Club Rock committee. Jaime identified with the program on a personal and professional level in such a way that it aligned with her life goals and dream career. All the pieces of the puzzle came together after a six-year journey when she was offered the music therapist position at Kids Rock Cancer. “If you love what you do, it shows and if it feels right, go with it,” Jaime says. Kids Rock Cancer is very excited to announce that through generous donors and community partnerships, the program has added a third therapist, Cara Stern Sudbrock, to its team! Cara found her calling for music and the helping profession at a very young age. She has been singing, performing and volunteering since her early elementary years. Cara always enjoyed performing in choirs and ensembles. industry. 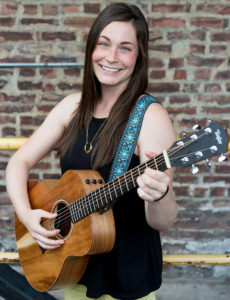 While in Nashville, she observed the senior music therapist at Vanderbilt Children’s Hospital and quickly found her passion — helping others through the power and evidence based practice of music therapy. 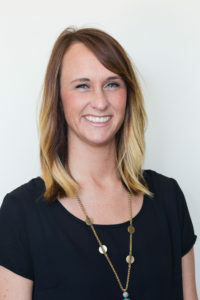 Cara decided to move back to St. Louis to attain a master’s degree in music therapy from Maryville University. Cara has worked with a diverse clientele including children, adolescents, and adults with developmental and intellectual disabilities, learning disabilities, speech disorders, physical disabilities, visual impairments, traumatic brain injury and behavioral health. Cara is currently employed by Music Therapy St. Louis, where she sees a variety of clientele. Along with being a long-time volunteer with Kids Rock Cancer, she says, “I have my dream job.” Cara is passionate about advocacy in this field, and has a desire to help others by empowering them through the medium of music.